We’re happy to present our findings from our recent ‘Sisters, Act!’ project, as outlined in our blog post. The information here is also available as an infographic. Click to download pdf. 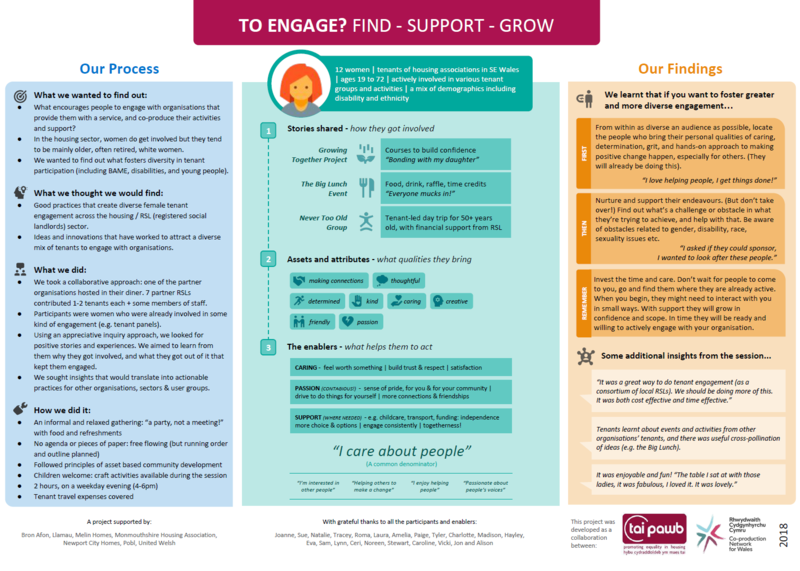 What encourages people to engage with organisations that provide them with a service, and co-produce their activities and support? In the housing sector, women do get involved but they tend to be mainly older, often retired, white women. We wanted to find out what fosters diversity in tenant participation (including BAME, disabilities, and young people). Good practices that create diverse female tenant engagement across the housing / RSL (registered social landlords) sector. We took a collaborative approach: one of the partner organisations hosted in their diner. 7 partner RSLs contributed 1-2 tenants each + some members of staff.Participants were women who were already involved in some kind of engagement (e.g. tenant panels). Using an appreciative inquiry approach, we looked for positive stories and experiences. We aimed to learn from them why they got involved, and what they got out of it that kept them engaged. SUPPORT (WHERE NEEDED) – e.g. childcare, transport, funding: independence more choice & options | engage consistently | togetherness! From within as diverse an audience as possible, locate the people who bring their personal qualities of caring, determination, grit, and hands-on approach to making positive change happen, especially for others. (They will already be doing this). I love helping people, I get things done! Nurture and support their endeavours. (But don’t take over!) Find out what’s a challenge or obstacle in what they’re trying to achieve, and help with that. Be aware of obstacles related to gender, disability, race, sexuality issues etc. I asked if they could sponsor, I wanted to look after these people. Invest the time and care. Don’t wait for people to come to you, go and find them where they are already active. When you begin, they might need to interact with you in small ways. With support they will grow in confidence and scope. In time they will be ready and willing to actively engage with your organisation. It was a great way to do tenant engagement (as a consortium of local RSLs). We should be doing more of this. It was both cost effective and time effective. Tenants learnt about events and activities from other organisations’ tenants, and there was useful cross-pollination of ideas (e.g. the Big Lunch). It was enjoyable and fun! The table I sat at with those ladies, it was fabulous, I loved it. It was lovely.